Many thanks to Kevnic2008 for sharing this! Smooth mild yeasty beginning. Lots of fruity esters there, banana and clove. The aftertaste is quite short, not too intense with a nice yeatsy smooth aftertaste. 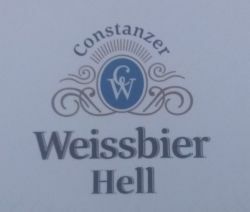 Draught at Constanzer Wirtshaus. Pours cloudy orange with a medium, frothy white head, medium retention with good lacing. Aroma is heavy banana esters and earthy wheat malt, light cloves and citrus. Flavor is s moderate earthy wheat malt, lightly spicy and clove phenols, light citrus and medium banana esters with a dry finish. Medium body and moderate carbonation.